Gmail has been the center of my online universe for the past few years. And I appreciate every little help to make me even more productive with my emails. Gmail already has a ton of features that can make you a productivity ninja. Labels, Filters, etc to name a few. You probably knew already that you could bookmark various parts of Gmail easily. 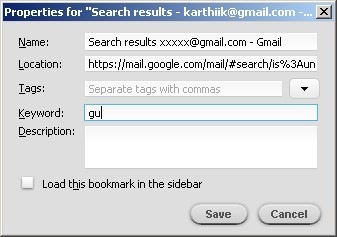 You can also bookmark individual emails for quick access through a Gmail Labs feature called ‘Quick Links’. All you have to do is go to the email you want and click on the ‘Add Quick Link’ in the Quick Links widget. Now is the awesome part. 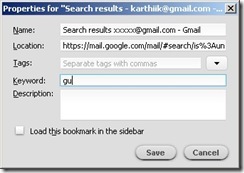 Now, lets add a keyword by right clicking on the bookmark and go to properties. So, now anytime you want to bring up your unread emails in Gmail, just type in unread (or the keyword you used) in Firefox and voila! You can change the in: keyword to any other label you may have to bookmark a particular type of emails. The sky is the limit with this trick. Check out similar Gmail related posts and more tips and tricks. Really nice trick that i used for my mail now. Thanks for sharing.